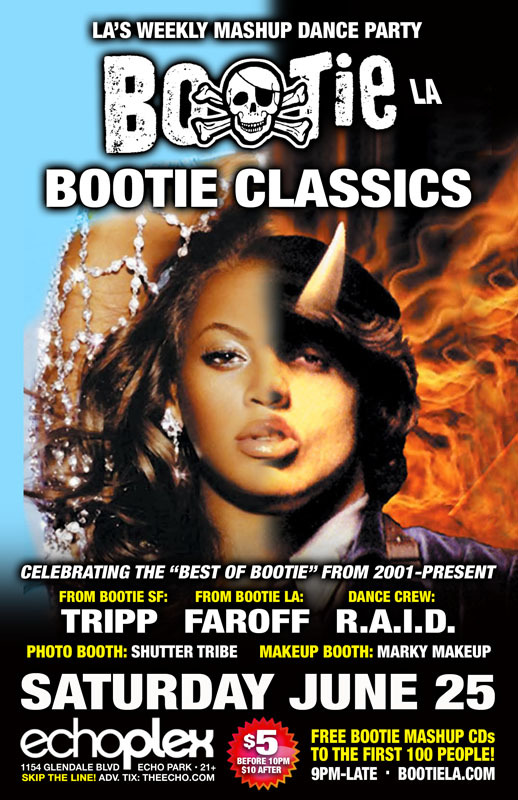 Bootie LA always plays the best mashups in the world, but tonight it's the "Best of Bootie" from the past to the present, with Bootie SF's DJ Tripp joining LA's own Faroff -- it’s Bootie Classics! Only $5 before 10 PM! Bootie SF resident DJ Tripp comes down to join LA resident DJ Faroff, as they dig deep into the mashup vaults for Bootie Classics. They’ll be spinning the “Best of Bootie,” from 2001 to today! Resident dance crew R.A.I.D. (Random Acts of Irreverent Dance) will keep you dancing with their go-go antics on stage, while Marky Makeup gives you makeovers, and house photographers Shutter Tribe capture all the fun!